No need to squeeze - this one has plenty of room for everyone! 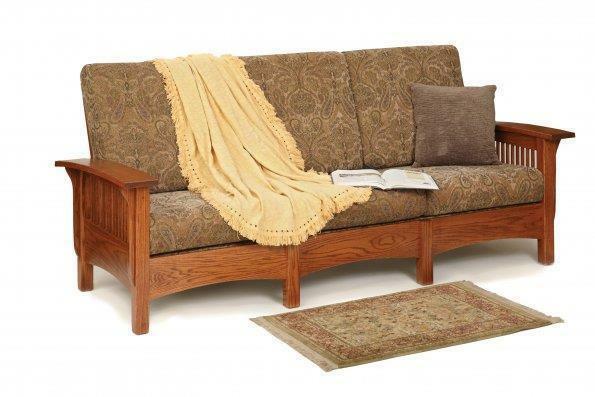 Handcrafted by seasoned Amish woodworkers for a finish that's as beautiful as it is durable, the Morris Mission Sofa brings together style and substance in one time-defying package. The Morris's thick cushion foam and noise-free springs bring real support and comfort to its seats, while its hand-cut custom upholstery and smooth, hand-sanded surfaces add a level of everyday luxury that mass-produced pieces just can't hope to match. Taken as a whole, this is an upholstered sofa that wants nothing more than to serve the living room and the family for as long as they need. Your Mission Morris will be handcrafted to order in your choice of wood, stain, and leather or fabric. If you have any questions at all, or if you would like to see free samples of any of our woods, stains, or fabrics and leathers, please reach out to our team by phone or by email at any time. We love the roomy luxury of this piece, and we would love to talk with you about the decades of movie nights and more that it brings to the home. Note: You can provide your own fabric. Call for more information. 7 1/2 yards of fabric or leather is needed.